ent (ATM). ATM is a verbally guided lesson structured to help you to discover your unique habits and patters through a mindful and playful movement exploration. 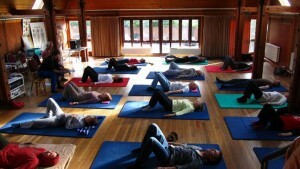 Such a one-hour lesson usually takes place lying on a mat, but can also be performed in a sitting or standing position. Each lesson is constructed around a given theme aiming to improve such body functions as: rolling, crawling, reaching, twisting, sitting, balancing, walking etc. The movements are performed slowly and with minimum effort so that participants have the time to sense, feel and perceive all the different components (breathing, initiation, coordination, timing, sequencing and muscular effort) involved in that movement. Participants learn to abandon habitual patterns and develop new alternatives to move more efficiently and with greater body awareness. If you have any health problems please consult with your health care practitioner before doing any of these lessons. Though they are very gentle, some lessons may not be beneficial for you.